Yesterday was the 5th of December. That's the day that the Dutch people celebrate Sinterklaas (Or Sint Nicolaas, but that's a rather old fashioned name). In the evening families and friends gather around to treat themselves to hot cocoa and Dutch dainties such as speculaas, boterletter, marsepein and pepernoten. Meanwhile they wait in great expectation for a visit of Sinterklaas and Zwarte Piet to bring them presents. An alternative way to spend the evening is to give each other surprises (Dutch pronunciation: sur-pree-sus). A surprise is a selfmade object with a hidden present inside. An all time favourite to give as a surprise is a modified ontbijtkoek, another Dutch delicacy. An ontbijtkoek is a kind of dark brown cake. To transform the ontbijtkoek into a surprise, you have to make an incision in the cake and put your present inside. Please make sure that your present isn't any bigger than the cake itself and is well wrapped in plastic to make this surprise a success. The next step is to moisturize the cake and mould it untill you'll have a long cylindrical shape. Because of the dark brown colour of the ontbijtkoek, it will look just like a gigantic turd. It's also very sticky because of the syrup that's used in the ingredients. The lucky person who gets this surprise has to grab into this sticky moist turd with bare hands, in order to get the present out. There's Dutch humour for you! But I'm digressing. It was not my intention to write about silly Dutch customs. 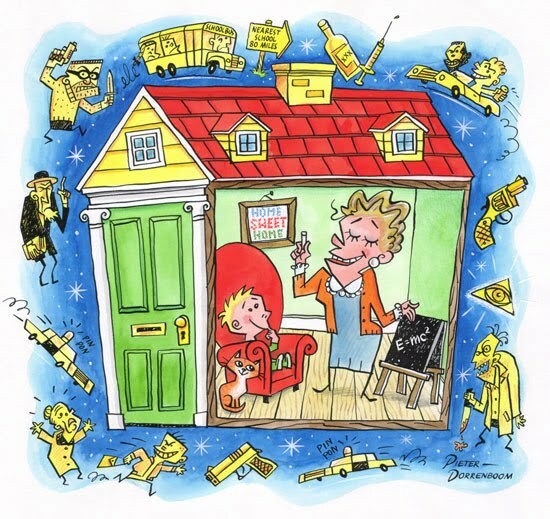 Still, to make it understandable for the non-Dutch readers of this weblog what the illustration below is all about, I have to tell you something more about Sinterklaas. I assume that most of you have at least heard of this white-bearded bloke dressed up as a bishop and might even have noticed some remarkable similarities with that other ditto-bearded chap named Santa Claus. However, there are some significant differences. Like Santa Claus, Sinterklaas has his little helpers. Not elfs, but Zwarte Pieten. Santa Claus has his residence up the north pole, Sinterklaas lives in Spain. Each year, somewhere around the midst of November, he and his Zwarte Pieten travel to the lowlands by boat. In the night following on the day of their arrival, the Zwarte Pieten climb upon the roofs of the Dutch houses and lower themselves through the chimneys to deliver little presents for the children. Unlike Santa Claus, they don't put the presents in stockings that are hung upon the mantelshelf, but in the children's shoes that are standing before the stove. This ritual repeats itself on pakjesavond (presents' eve) on the 5th of December, but it's also possible that Sinterklaas will bring a personal visit, like I wrote above (well, that's the same with Santa Claus, isn't it?). Some children are blessed with a more frequent present delivery through the chimney, but that all depends on the financial status of the parents, really. For transport Sinterklaas prefers to use a grey horse, rather than a reindeer sleigh. It is said that Sinterklaas also climbs upon the roofs with horse and all, but I don't believe he ever crawled through chimneys. During their visit in the Netherlands, Sinterklaas and the Zwarte Pieten naturally have to find an accommodation to sleep, eat, drink and relax. So De Dubbelde Palmboom came up with the idea to lend their museum for that purpose (all fictional off course). Whilst Sinterklaas and his Zwarte Pieten are on the job, children can visit the museum to see the rooms where these do-gooders have layed out their bivouac. The museum had asked me to make an illustration of this, to be used for a poster and a postcard. For this I chose to make use of what I like to call the dollhouse view. I don't know if this is common known term, but looking at the illustration below, you'll immediately understand what I mean with this phrase. 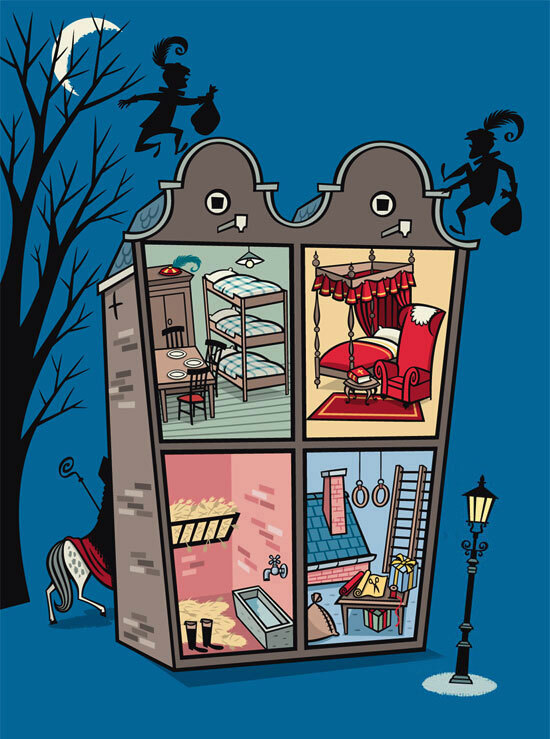 At the top left of the "dollhouse", you see the room where the Zwarte Pieten have found their shelter. Right next to it is the bedroom suite of Sinterklaas. Underneath the room of Sinterklaas you find the place where de Zwarte Pieten wrap up the presents for the children and practice their climbing skills. On the lower left side you see the stable for the horse of Sinterklaas. On top of the building Zwarte Pieten are busy climbing the roofs. They carry the presents in big gunny sacks, very much like Santa Claus does. The tree and moon on the left are a hint to the classic Sinterklaas carol Zie de maan schijnt door de bomen (See how the moon shines through the trees). I do like to draw dollhouse views. Therefore it may not surprise you that this was not the first time I used this kind of composition. My first dollhouse view was published on the 28th of June 1997. 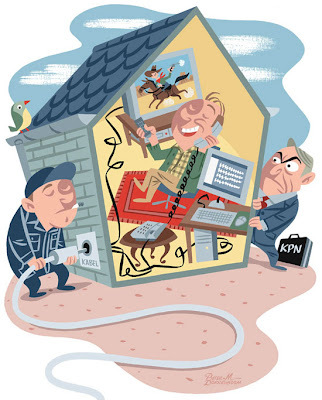 It was an illustration for the Dutch newspaper Algemeen Dagblad. The subject was home education in the United States of America. It's a rather simple view with just one room, but I didn't need more rooms to illustrate what the story was about. The next one was published on 2nd of October 2004 in the same newspaper. This time the story was about the rivalry between communication companies and KPN, a Dutch company which used to have a monopoly on communication. Still just an one room view for the same reason as mentioned above. Almost four years later (February 9, 2008) I made another dollhouse view, still for the same newspaper. This time it was a three room view. The illustration had to be about taxes you'll have to pay for almost everything. The blue-purple envelope is a bugaboo for Dutch citizens. It usually contains another assessment. 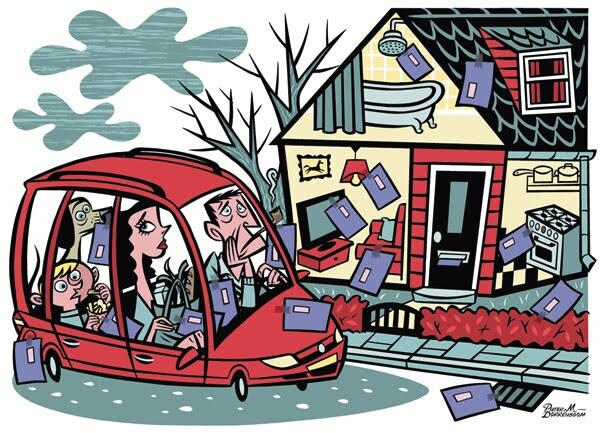 When I look at this illustration, I always have to think of that song by the Fab Four: Taxman. Mind you, when Mister Harrison wrote this song, he had already earned more money than he could probably ever spend. It's a bit harsh that he should be the one to complain about taxes. Still a great song though! Besides drawing dollhouse views, I also like to look at them. Although I might have made up the phrase dollhouse view myself, I'm most certainly not the first one who made that kind of picture! Just look at this book made by the famous Richard Scarry (first published in 1964). Here's a man who really knew how to make a dollhouse view! 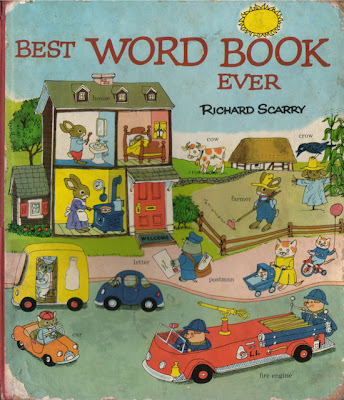 If you also happen to have this book, please look at pages 10 and 11 (the Rabbit Family House). Alas, because of the size of the book it's not possible for me to scan this spread page, but - boy, oh, boy! 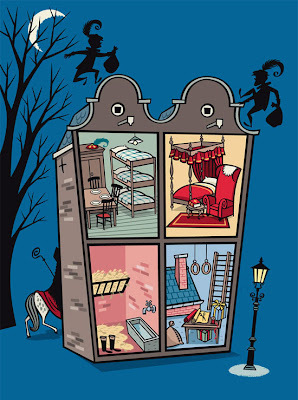 - this must be the most superb dollhouse view I ever laid my eyes on! 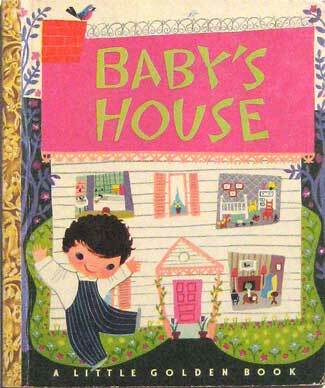 Although not as outspoken as Richard Scarry, the front cover of Baby's House (first published 1950) made by the very talented Mary Blair should also be classified as a dollhouse view. The three visible rooms are rather small and Mary's approach is quite stylistic. On the other hand (probably not intented as such, but I wouldn't dare to claim that for a fact), looking at the proportions of Baby in comparison with the house, the building itself is - an enormous , true enough - doll house! Be it intended or not, the result is a beautiful picture indeed! Sadly enough, these are the only two examples of dollhouse views I could find in my library. However, I know for sure there must be many, many other illustrations with this kind of view. If you would happen to know any that deserve to be brought to attention, please let me know. It would be my pleasure to dedicate another weblog to this phenomenon.